Back in the 1999 I was using an Atari ST without even a hard drive. There were some applications for sending and receiving e-mail messages available, but all of them shared the same faults: pretty much needed a better hardware to run smoothly, didn’t display Polish characters correctly, allowed to use one e-mail account only, and their user interfaces… Well, let’s say, left much to be desired. So, it turned out that if I actually wanted to use e-mail on my computer, I had to write the client application myself. 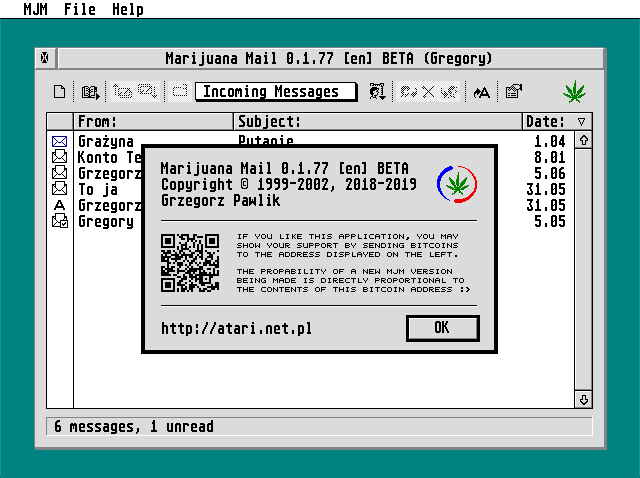 That’s how Marijuana Mail (or MJM for short) was born – a basic, lightweight e-mail client for 1040ST with TOS 1.0 and no hard drive. Later on, when I switched to Atari TT, I have added multitasking and color modes support. Three years later, in 2002, the application development had to stop, as my Atari died and I switched to a Mac. Fast-forward to 2018: Marijuana Mail is back! I have treated myself with a MiST (a wonderful little device that re‑implements the Atari ST using an FPGA chip), restored my Atari stuff from backup (yes, I was making backups before it became popular), and made some much needed fixes to MJM. Minimal system requirements: Atari ST with 1MB RAM, TOS 1.0 and monochrome monitor. Yes, that one from 1985 will do just fine. STinG is required to connect with the network (that’s right, you can actually connect Atari 1040ST to the Internet using an Ethernet cable — all you need is NetUSBee cartridge, which you may build yourself or buy from Lotharek). External setup utility (so that the main application is smaller, which is important for 1MB machines without a hard drive). The editor is built in — so there is no need to load an external one from the floppy disk. You don’t have to delete the downloaded messages from server: MJM will try to ignore any messages that have already been downloaded before – even if they have been deleted from the Incoming Messages folder. Up to 9 separate user profiles can be set up, each with a different e‑mail account. Note that SSL encryption protocol is not supported. It means that MJM will not work with the mail servers that force you to use encryption, such as Gmail or iCloud. After unpacking the archive you need to run MJ-SETUP.PRG, choose your language and create at least one user profile. The process is quite straightforward — there are no poorly documented user‑editable config files, just plain and simple dialog boxes with Back and Forward buttons. If you are really willing to use MJM on Atari 1040ST without a hard drive, you may want to copy only the essential files onto your e‑mail floppy: MJM.INF (the configuration file), MJM.PRG (the application itself), MJM‑EN.RSC (the resource file for the English language; you need only one RSC file for the language selected in MJ‑SETUP), MAIL folder (where your messages are stored) and USERS folder (containing your user profiles). Marijuana Mail was born when the Internet access was very expensive and you had to pay for each and every minute you were connected to the network. Therefore, the application works just like in the old times, when you wanted to connect to the Internet for as few minutes as possible (just enough to quickly download any new messages), disconnect, and then read the mail offline. Yeah. It may feel awkward for those of you who are used to the permanent Internet access, but hey, the permanent Internet access still feels a bit strange to me. TOS 4.92 and Falcon (emulated using Hatari). Notice the ugly window background color, it is caused by that awful default TOS palette. Can be fixed by installing NVDI. See this little Atari logo at the top of the window? 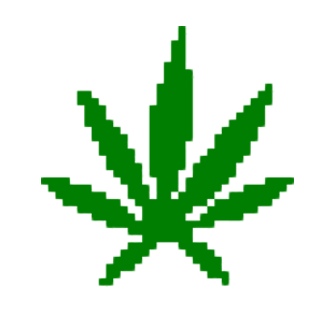 It means the received message has been sent from an Atari computer (with Troll, ASH Emailer, Newsie or any other e-mail client, not necessarily using Marijuana Mail). If the sender uses an Apple device (Mac, iPhone or iPad), the Apple logo is displayed instead. Have fun with Marijuana Mail!